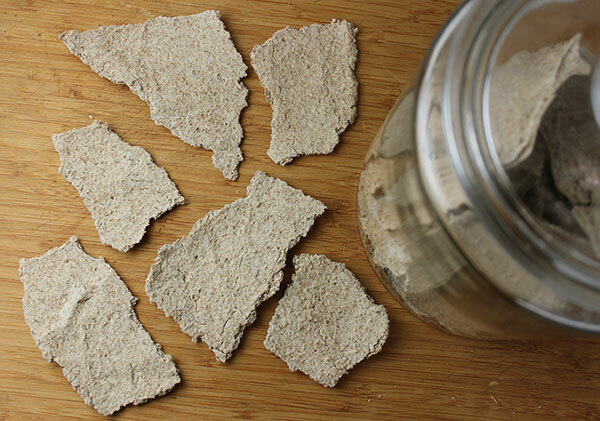 These sprouted rye crackers are the raw dehydrated version of the traditional Swedish crispbread made from rye flour, water and salt. 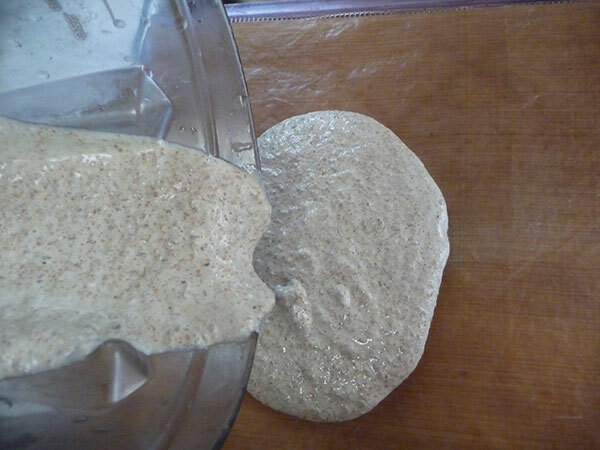 Our version is created in a similar fashion using only a few basic ingredients, but instead of flour we sprout whole rye grains which we process with water to make a pourable dough-like consistency. This mix is then laid out on dehydrator sheets and dried at a low-temp setting, rather than baked in an oven. 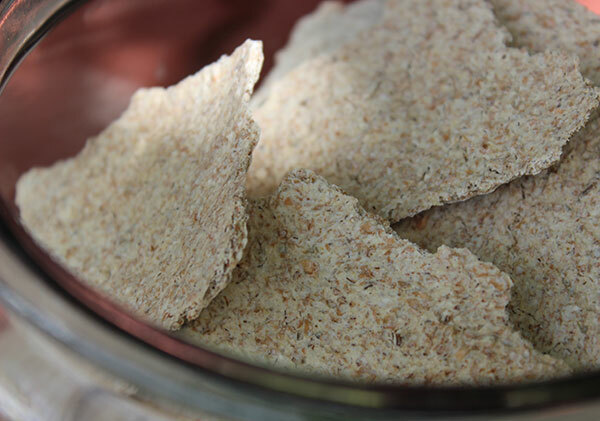 The crackers dry out quite fast compared to most dehydrated foods and will basically be ready the same day you dehydrate them, if you start them early. Rye crisps are one of our personal staples that we always have stored in glass jars available for a quick snack or bread replacement with meals. In Sweden crispbread has been consumed for over 500 years and was customarily made in large quantities after the grain harvest and stored throughout the year as a convenient food source. 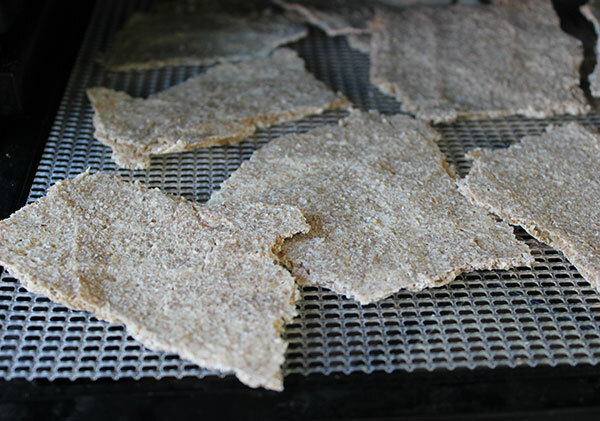 This sprouted cracker-making method preserves and activates the nutrients and enzymes present in the rye grain and as a result produces an energizing cracker that is easier on the digestive tract and is less of a mucus-forming food. 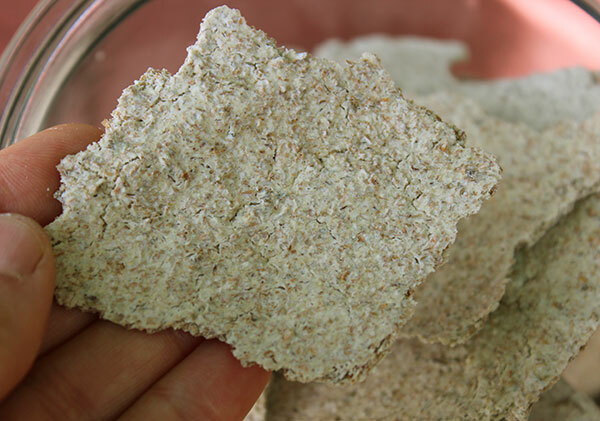 Although rye is not a gluten-free food, for most people they are a highly digestible cracker. Soaking and sprouting glutenous grains like wheat, kamut or rye, before you use them in recipes, dramatically increases their nutritional value. In fact, some people who generally can't tolerate gluten, don't have the same experiences with sprouted grain varieties. This is because the soaking and sprouting process helps to reduce enzyme inhibitors and other toxins that make it harder to fully assimilate dry grains when consumed as flours in baked breads, crackers and various desserts. As the term "gluten" implies, they virtually turn to "glue" in your stomach. In some cases enzyme inhibitors, like phytates can also bind to essential minerals like calcium, iron, and magnesium and prevent their absorption. In a 2010 study it was shown that germinating and activating the enzymes in grains make them "highly efficient in the elimination of residual toxic peptides of rye secalin." Secalin being one of the forms of gluten proteins that is not digestively tolerated by those with celiac disease. Rye, also called rye berries, is closely related to wheat and other grains like barley. In a study published in the Journal of International Food Sciences and Nutrition monitoring the germination process of wheat grain, it was shown that while the dry grain had "barely detectable" levels of antioxidants, amounts of vitamin C, vitamin E and beta-carotene continued to rise significantly throughout the sprouting procedure. In addition, it was also demonstrated that other nutrients found in wheat, like ferulic and vanillic acids, also increased in concentration after the wheat was sprouted. Soaking and sprouting other whole grains, like quinoa, buckwheat, millet and rice is also recommended before cooking them. 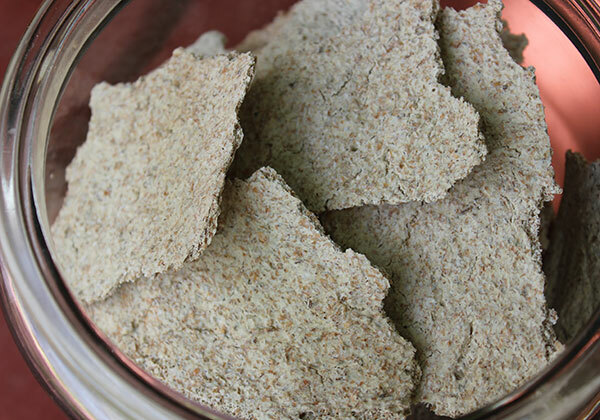 Moreover, grains can also be sprouted, dehydrated and ground into a flour as an alternative to straight dry grain flours if you are someone who tends to bake with flour products on occasion, or they can likewise be used to make other types of dehydrated crackers. In addition to these health benefits, when making sprouted rye crackers, the sprouting process also naturally adds a pleasant soured taste and, when combined with a small amount of caraway seeds, creates a delicious flavorful cracker. How to Sprout Rye Grain? Sprouting grains employs the same technique use for germinating other types of sprouts, like broccoli, fenugreek or when growing wheatgrass or sunflower sprouts. This involves using two 16 ounce glass mason jars with mesh lids (or one 32 ounce jar) and soaking and sprouting the rye for a 1-2 day period. Clean all equipment in hot soapy water and dry. 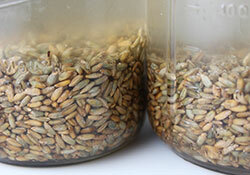 Place two cups of dry rye grain on a flat clean surface and remove any odd pieces or bad seeds. In a bowl of pure water, add your grains, stirring them around to remove any dirt or debris and strain. Either divide the rye into two separate 16 oz jars or place them in a 32 oz jar. Filled the jars 3/4 full of pure water to soak the grain overnight, or at least 12 hours, using a loose lid on top. After 1-2 days, depending on the room temperature, you will notice tiny white sprouts begin to appear. Continue to rinse once daily until most all of the grains have sprouted. The sprouts can be stored in the refrigerator with a lid until your ready to use them in your sprouted rye crackers. 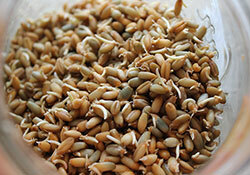 When your have your sprouted grains, you are now ready to blend them up with other ingredients into a wet rye dough. One of the tricks to getting just the right texture and crispness is in the amount of water content you blend with your sprouted grains. Two cups, we have found, is just about right for this recipe. Also, using a high speed blender over a food processor is best for thoroughly breaking down the rye to create a very smooth texture without hard bits of grain in your dried crackers. Before placing the grains in a blender we like to process them in a food processor first to initially break them down, which makes them easier to blend. Add to a bowl with the rest of the ingredients, except water. You can either split the blending into two parts or add all the ingredients into a high speed blender. Add the water in first, then the sprouted grain and other ingredients. Blend on high until completely smooth, which may take several minutes. Pour your mix onto two square non-stick Excalibur dehydrator sheets with screens underneath for support. Spread out close to the edges of the sheet. 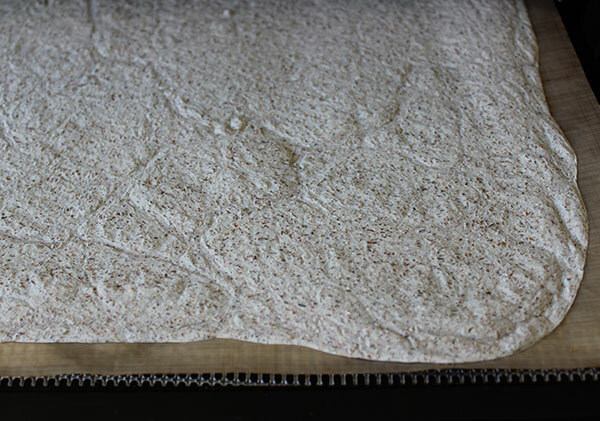 Dehydrate for 4 hours, then flip the sheet over onto the screen. At this point to can break them up into organically shaped cracker size pieces. This will also help to speed up dehydration time. Dehydrate for another 3-4 hours or until crisp. Store in an air tight container or glass cookie jar in a cool dry place. 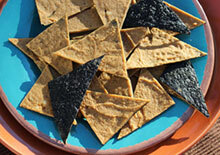 These sprouted rye crackers can be enjoyed with seed cheeses, sauerkraut or raw soups. They also make a nice garlic toast warmed in the dehydrator, using a spread of coconut oil and a sprinkle of garlic powder. For more chips and crackers visit our pages on how to make other dehydrated raw vegan recipes like cheez its, kale chips and squash chips. If you enjoy using sprouted grains you might also enjoy our carrot raisin Essene bread and rejuvelac recipes in the links below.